Today we’d like to introduce you to April Teixeira. It was November 2010; I was in the middle of a divorce process when I also became unemployed. 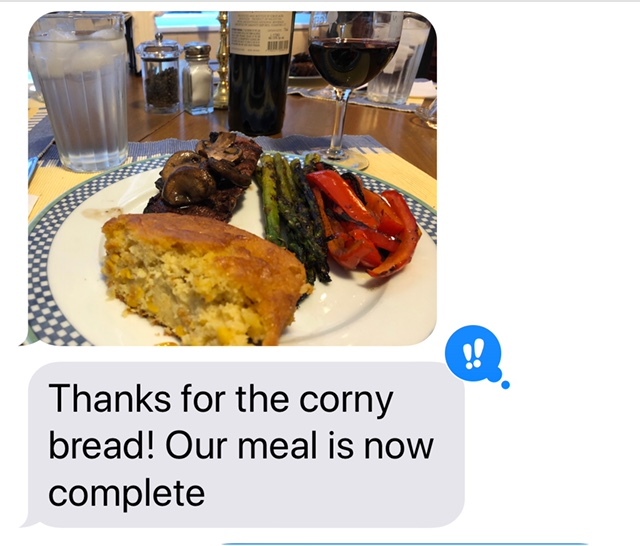 During a phone conversation with my Cousin Steph, I expressed uncertainty about the future for myself and my children, and that I needed additional financial resources; she suggested: “sell your cornbread to make some money.” I hemmed & hawed, and said: “who’s gonna buy cornbread? ?” Being a very spiritual person, she quoted a Bible verse that basically states: speak of things that are not, as though they are! Immediately upon hanging up the phone, my attention turned back to a TV program I had been watching as the announcer pointed (seemingly) right at me saying “God has placed something on the inside of you, and it’s up to YOU to figure out what that is, and what to do with it!” Moments later, a realization came over me that these two messages were likely not a coincidence, and I found myself searching for images of corn for inspiration, but the image I found was “SO CORNY!” Then, I burst out laughing: “The “Corny” Bread Company!” You see, my cornbread had whole kernels of corn baked in! I sent out email and text message blasts announcing my “business” to family, friends and former colleagues and to my delight received the very first orders instantaneously!! After checking with my local town government on the legalities, The Corny Bread Company was up and running from my home kitchen! I developed a rudimentary business plan, determined serving sizes, costing, and a production & distribution schedule to deliver “Corny Bread” in my minivan dubbed “The Corny Bread Mobile;” I even promised a corny joke with every order and customers held me to it!! My only intent at the time was to make enough money to ease me through the holidays, however, I continued receiving orders for Corny Bread for office parties, birthday gatherings, graduation parties, etc. 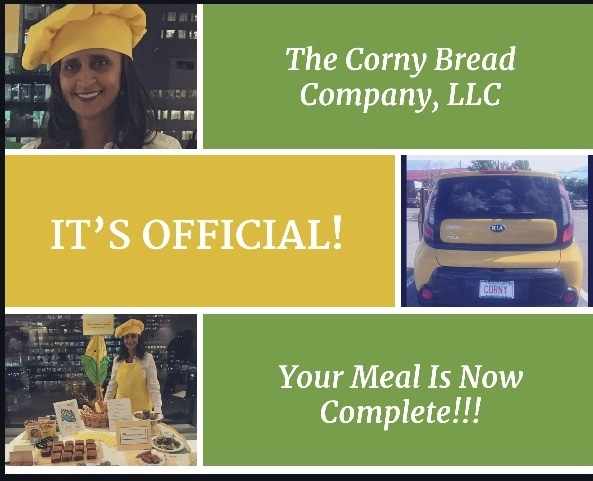 ; it was quite amusing to me, especially with a name like “The Corny Bread Company!” What I didn’t understand at the time, is that I was developing a “brand;” soon after, Corny Bread had become a household name amongst family, friends, and new customers alike! Once the recipe was perfected, I had a fully prepared, moist, and versatile cornbread; the flavor profile is so unique that it complements any meal from breakfast (#TossTheToast) to Thanksgiving Dinner!! I then went on to develop a line of “cornbread creations” from that very same proprietary dry base. 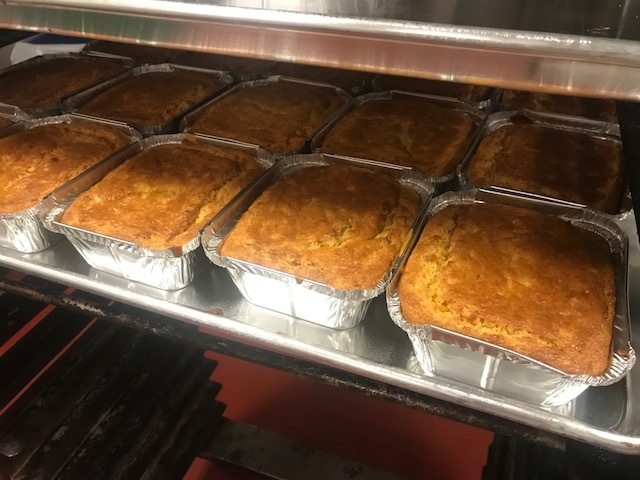 In addition to Corny Bread, we now offer HOPcorn: bite-sized Corny Bread made with BEER, which I specifically developed for the Craft Beer/Taproom Industry. The idea for HOPcorn was brewed (pun intended) from a day-after-Thanksgiving discussion with my family; I was sharing some information about a pitch competition sponsored by Sam Adams Brewery and mentioned that I was going to develop a variety of Corny Bread with beer baked in. My Uncle Mike commented: “if you could make it in bite-sized portions that would be more appealing for a bar atmosphere;” well it was 3 a.m. the next morning when the imagination took over and the idea for HOPcorn popped!! I am also now offering “customization” of HOPcorn where we prepare the batch using specified beers from local breweries, for events to be held at their location. Recently developed is “Corny Bread~Wheat Free” for our customers with gluten sensitivity; I wanted this product to maintain a comparable taste & moist texture to Original Corny Bread, and my test-market families approved!! I’m also excited about introducing our newest character in the line-up, Nibbles: snack-sized Corny Bread … so you can nibble all day! (Note: Nibbles are square mini-muffins!) The creation of these additional products enhances the company tagline: With Corny Bread, Your Meal Is Now Complete!!! 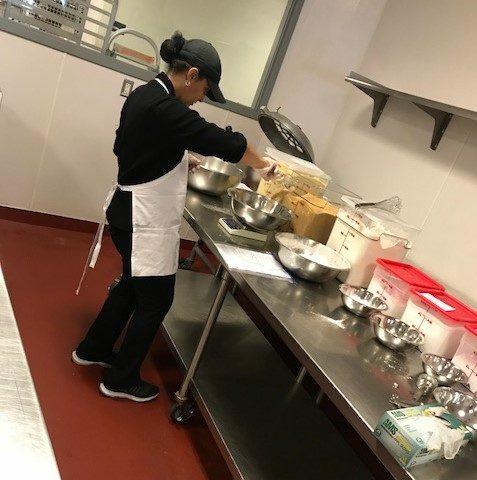 Of course, I also had to become a culinary student as it pertained to the knowledge of baking, which required a great deal of product development; the result was a lot of “less-than-desirable” Corny Breads in the process, yet, this was my self-defined passion and I had to commit to mastering it! And then there’s the business side of the business which I knew nothing about; I mean there are legal and financial considerations that need to be made BEFORE starting your business, and then there are legal and financial considerations to be made in order to STAY IN BUSINESS. Having the passion & creativity to work “on” your business can be fun, but maintaining the tenacity to continue striving with every step you make working “in” your business is hard work, yet so necessary for a desirable outcome! ADVICE: commit to being a student. So, as you know, we’re impressed with The Corny Bread Company – tell our readers more, for example, what you’re most proud of and what sets you apart from others. I’ll have to admit, I am quite proud of The Corny Bread Company Brand and perhaps more-so tickled that it really works! You see, starting my business was an idea wrought from a disappointing and financially tough period in my life; what I needed most was laughter and a spirit of optimism, which is hard to come by when things appear bleak. 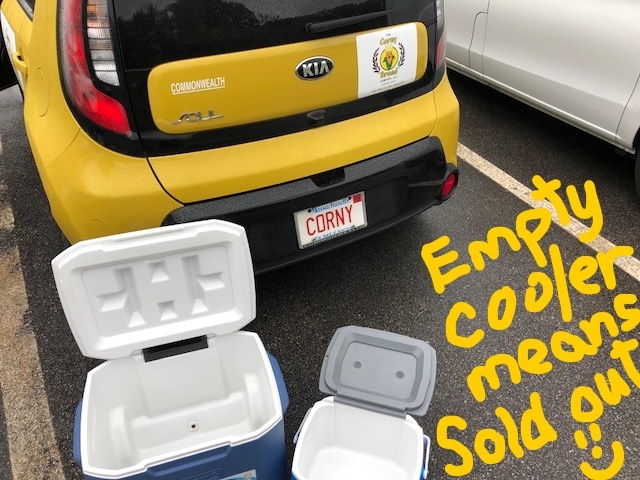 Fortunately, the corny name for the company came about organically, then the corny jokes provided a platform for laughter; but the day I saw a yellow Kia Soul drive past me and a friend dubbed it “cornbread yellow,” I knew it had to be part of the branding! A few months later when I received notification from the MA Registry of Motor Vehicles that my requested vanity plate was available, it was cinched: CORNY!!! People often point, laugh, and take out their cell phones to snap pictures when behind me at a red light – I get such a kick out of watching them through the rear-view mirror!! 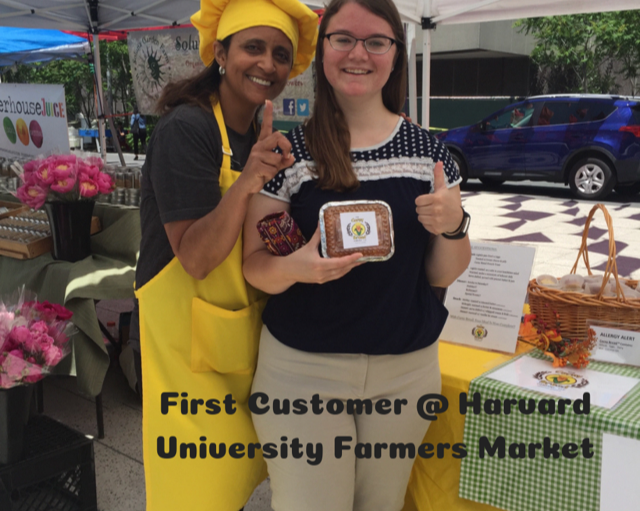 Now that I am doing weekly farmers markets & pop-up markets, when people come to peruse The Corny Bread booth with a serious and inquisitive expression, I say “Hi! Are you here for a corny joke?” It takes them a second to process what I am asking but that’s almost always followed by laughter! So, I’ve come to establish that the culture of The Corny Bread Company is to make people smile and laugh, and of course, to offer them delicious and unique cornbread creations with creative pun-intended names! We often don’t know what is on the other side of a person’s expression, and if they walk away from me smiling and feeling a little bit happier, then that pleases me! I love the customers who come back for their weekly “Corny Bread fix” as they say, and have been holding onto a corny joke to share with me; that’s TRUE CUSTOMER ENGAGEMENT- and I love it!! First, for the aspiring Culinary Entrepreneur, I’d say apply yourself to being a member of a “culinary incubator.” An incubator, as the name would relate to an incubated and premature infant, is where that infant is provided with appropriate support and nourishment towards being healthy, and for the best outcome of full growth potential. This is the case with CommonWealth Kitchen Culinary Incubator, a shared-use commercial kitchen facility in Boston (Dorchester) where I am a member business. In this community of new and established businesses, there is a wealth of knowledge and experience where new entrepreneurs have access to existing business owners who are more than willing to share their learning curve; in other words, to help you quickly learn what not to do! And by having the first-hand ability to see their teams in action on a day-to-day basis, new Culinary Entrepreneurs also get to quickly learn what they “should” be doing to take their business from incubation, thru launch phase, and onto the road towards success! Additionally, as a member business of CommonWealth Kitchen (CWK), I am exposed to numerous opportunities for growth and distribution I would not have otherwise been privy to. Now, for ALL women blazing the path of entrepreneurship: set your compass towards “becoming.” Simply put by one of my mentors: Learn. Grow. Do. That means absorb what you don’t know and refine what you “do” know: research, talk to experts in your field, test market your product. Then, allow that new knowledge to develop you and even change some of your perceptions if necessary. Most importantly, be willing to APPLY that knowledge tirelessly! For the young woman: STAY IN ACTION! For the more mature woman: STAY IN ACTION!! At age 54, I am just getting started on my business; I can certainly tell you that it would have been physically less of a strain on my body had I started a business in this particular field 20 years ago … however, I’m getting it done!! In fact, it’s actually taught me several things about myself as it relates to passion, perseverance, and the WILL to succeed! I still chuckle when I think about what I said to my cousin “who’s gonna buy cornbread??! !” But when a friend asked me to consider “what if Mrs. Fields didn’t introduce her chocolate chip cookie (my favorite!) because there were already numerous cookies in the market space?” That realization was an “aha” moment for me! ADVICE: take your passion seriously; develop the vision necessary to convey your business plan to others, and keep in mind that the first “NO” you get, simply means “Not Yet!” Let that be your fuel for blazing the path of your dreams, and be committed to not letting that dream fade! 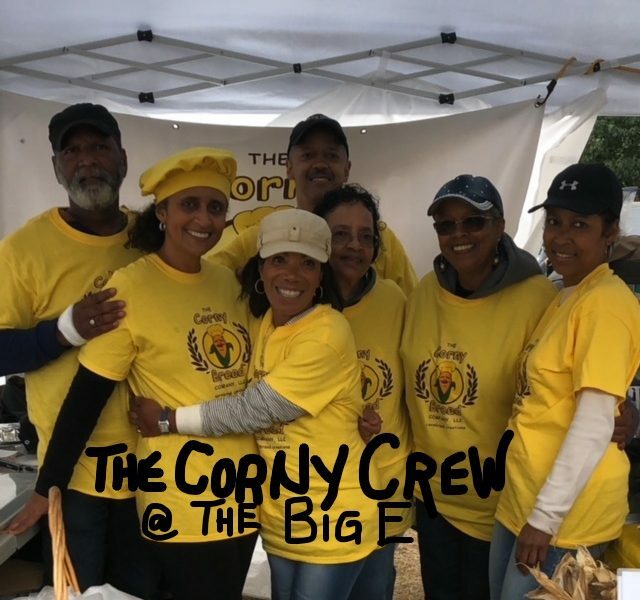 It took me 18 months to develop a proprietary recipe for Corny Bread, and more than two years to become a member business at CWK; celebrate your every step and know who you are becoming! When a baby takes that first step, they quickly learn more steps like that will get them to a different place! That is not meant to be a simplistic statement, what I mean is, if you are the one making voice memo’s in the dark at 3 a.m. because something sparked your imagination, then continue to be a Visionary; if you’re handling the strategies for SM posts, website design & edits, email campaigns, or getting advice from the best in the industry – credit yourself as Social Media Manager or Marketing Strategist; running crowdfunding campaigns, bootstrapping, recording receipts and making day-to-day decisions about product distribution, YOU are the CFO and COO; stand proud and affirm yourself as CEO of your Enterprise!! 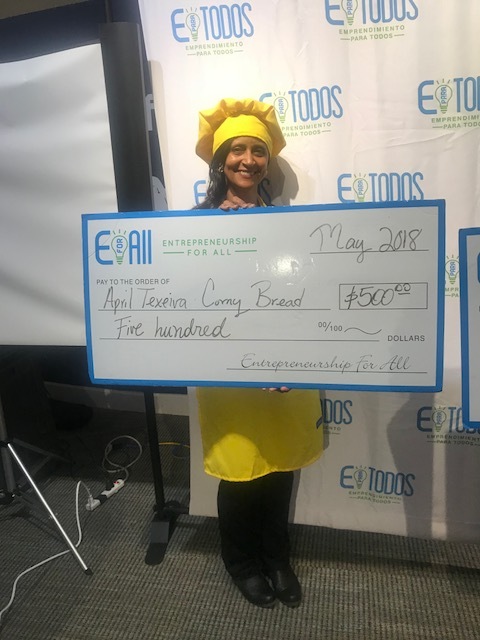 I formed The Corny Bread Company, LLC as a legal entity in March 2018, was accepted into CommonWealth Kitchen in April, and received my permit to operate a food establishment in May; for the first four months, I was reluctant to refer to myself as anything other than “the owner.” Though “titles” have low-priority impact on me, I now understand that in “being” the Visionary, Marketing Strategist, and CEO, there was a mental shift which provided the resolve to think beyond the title of owner which a person becomes simply by paying the legal fees for a business license. As a female founder, I had to BELIEVE that I could be whatever I needed to be for myself. 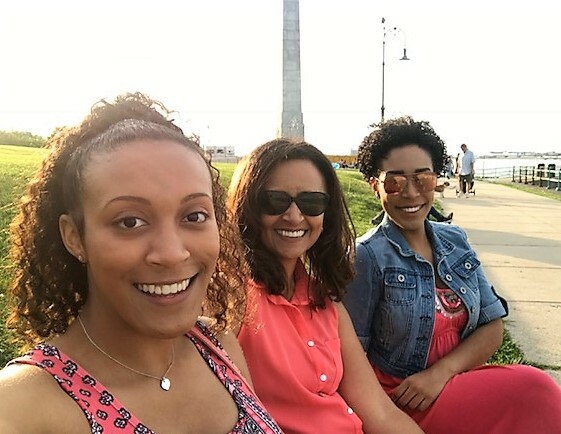 I want my journey to provide encouragement for other women who may look to me for inspiration, especially for my daughters & daughter-in-law, who themselves have been amazing examples of the tenacity and intelligence of women! As I journey through the next phase of my business, this is the very advice I speak to myself daily: Be patient with yourself. Apply consistent behavior (routines). Maintain an unyielding belief. I am so very grateful for the many opportunities I am a part of, especially the XcelerateBos 2.0 Entrepreneur Network & Business Accelerator (a product of The Urban Labs, Boston, MA), and for the many women (My Sisters), who “feed” me. I wish also to acknowledge the men in my life who willfully support my endeavors! And of course, for the loyal “Corny Bread” customers, to whom it has been my pleasure to serve, THANK YOU! Is YOUR next Meal Complete? As April’s Mom, I am so proud of her determination and commitment to make her dream a reality. Hard work, faith in God and trusting in her own abilities to reach her full potential will keep her firmly planted while her company continues to grow. I am not surprised at her perseverance- Her children have grown to become wonderfully gifted adults due to her determination to insure they had wonderful educational opportunities and now it’s her turn. . Congratulations on a job well done. My bff, wow, I’m almost at a lost for words. You are an amazing woman and have shown nothing except love and admiration for God, children, family and friends. I say may God continue to bless you and elevate your Corny Bread Company to many heights. I’m so happy and excited about the strides your are achieving. Please know that I will always support you and your dreams. I’m one of those loyal Corny Bread customers- almost obsessive actually. April’s delicious creations never last long in our home…our toddler has grown up with her fresh Corny Bread and HopCorn and will insist on 2 (ok ok maybe 3) servings at a time. My husband and I cant wait for a new delivery…and dare I say even our dog loves her Corny Bread. It’s a testament to how good her product line is- we have lots of picky eaters in this house! !